I can’t believe strawberries have been ready around here for two to three weeks now; just crazy! And as usual, we can’t get our fill; I’m most certainly going out this weekend and picking more. 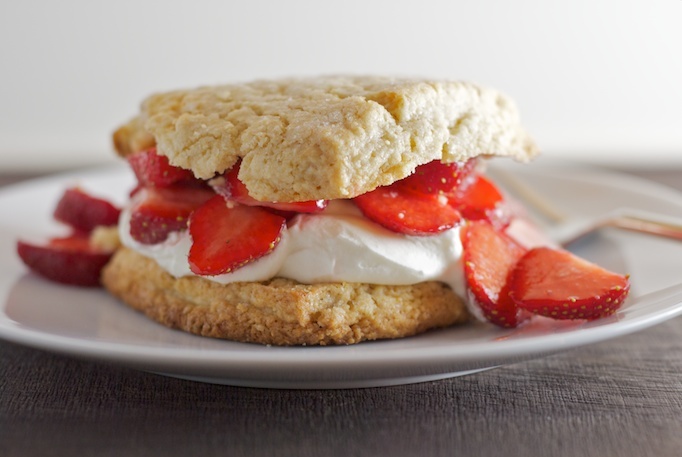 Strawberry shortcake is one of our favorite ways to enjoy them too. Simple, homey, with lightly sweetened fresh berries and perfectly whipped cream. I knew as soon as I opened my April Bon Appétit, that I needed to make these. I am a sucker for anything with almond so I left the magazine open to the page with the recipe, staring at me until strawberry season rolled around. And oh baby, the flavor of these shortcakes did not disappoint. The ground oats and almonds added so much flavor; you could easily eat the biscuits on their own or use them for other fruit fillings. I did find that the shortcakes were a little difficult to cleanly cut, but we didn’t really mind in the least. The flavor and crunchy sugar top made us completely forget about some random crumbs and a few unevenly broken biscuits. The second time I made them, I also froze the butter for 20 minutes, which seemed to help alleviate some of the cutting qualms from the first batch. This post was featured on The Kitchn, only one of my favorite food sites on the web! Pre-heat oven to 375°F. Line a baking sheet with parchment paper. Place cubed butter in freezer for 20 minutes, while preparing remaining ingredients. Pulse flour, oats, almonds, 1/3 cup sugar, baking powder, and salt in a food processor until finely ground. Add butter; pulse until only pea-size pieces remain. Add 1/2 cup cream and 1 teaspoon vanilla; pulse until large moist clumps form. Transfer to a work surface. Working quickly, knead until dough comes together, about 4 turns. Pat into a 4×6″ rectangle. Halve lengthwise, then crosswise into thirds. Arrange on prepared baking sheet, placing a good two to three inches apart. Brush with cream; sprinkle with 1/2 tablespoon sugar. 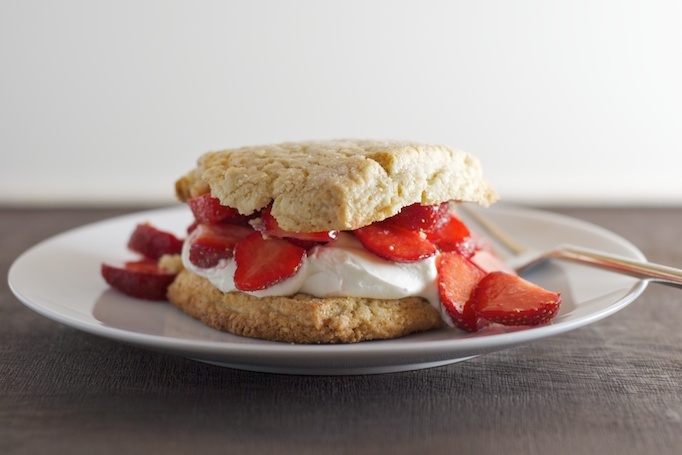 While biscuits cool, combine strawberries, and sugar to taste. Toss to coat. 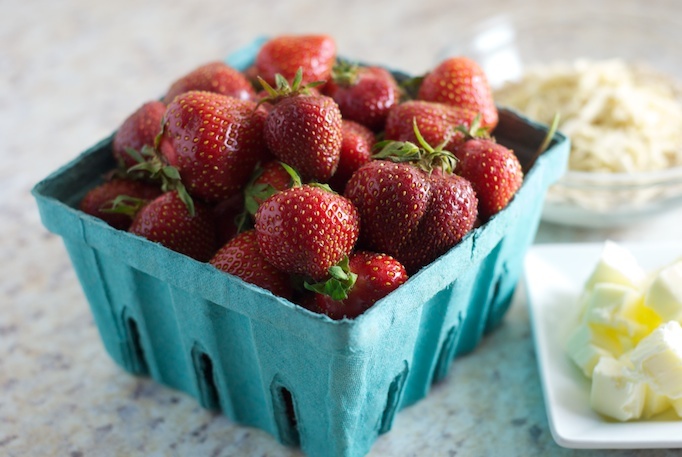 Let strawberries sit, tossing occasionally, until juices release. Whisk 3/4 cup cream, and confectionary sugar, to taste, until peaks form. 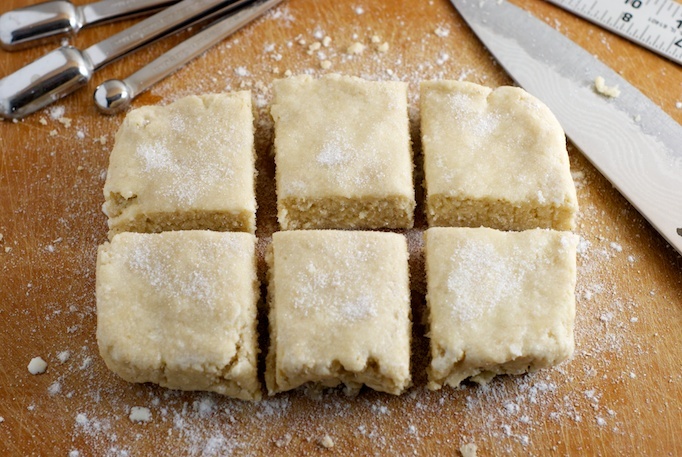 Cut warm or room-temperature biscuits in half; place bottom halves on plates. Divide whipped cream and strawberries over. Top with remaining biscuit halves. These look fantastic! 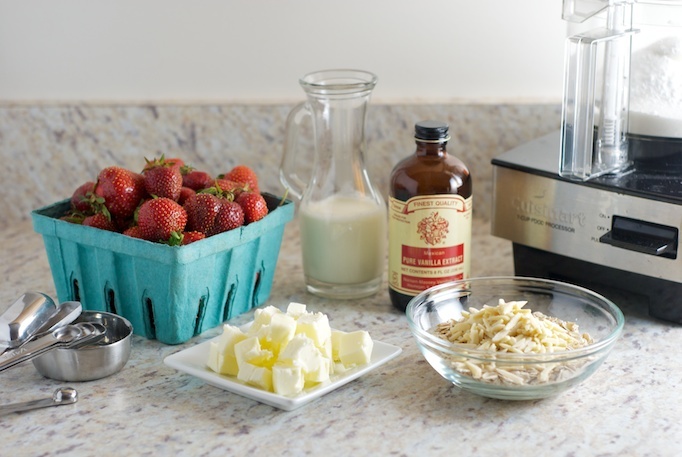 I’ve been waiting for a good strawberry recipe for the first batch at the farmers market and may have to try this one! Thanks! Don’t be disappointed if they don’t all cut perfectly. I only had two of my six cut cleanly, but we didn’t care, they were delicious.